About three months ago, a marketing agency from Denmark, called Action Europe Copenhagen conducted casual face-to-face market research interviews with 6 Malaysian Moms in Kuala Lumpur on motherhood and diapers topics. In early November, Action Europe Copenhagen plans to come to Malaysia again for further market research on the same topics with some Malaysian Moms. However, this time around they are going to do the interviews in one of Malaysia's charming cities, Penang. Thus, they are now in the midst of looking for two (2) Penang based Moms to participate at this market research. The questions for the market research interviews in Penang will pretty much be the same as those asked in Kuala Lumpur's interviews the other day. In principle, the interviewers from Action Europe Copenhagen would like to gather some information on how Moms in Malaysia take care of their children in general as our ways of raising kids or babies here in Malaysia are quite different from how Europeans do e.g. who takes care of the kids on daily basis, are you a working mother or stay-at-home mother, what brands of diapers that you use, what items you normally consider when purchasing diapers for your little ones and so on. Interesting and a piece of cake for you, Moms, to answer, right? The upcoming interviews in Penang will be held on Saturday, 2nd of November 2013 during daytime at one of the cozy restaurants inside the Hotel Equatorial Penang. Each interview (individual) session will take about 1 to 1.5 hours of time. Guaranteed, it will be fun and interesting session for you to attend - indeed some kind of market research interview that you probably have never experienced before! Trust my word on this because I did the interview with them in Kuala Lumpur too. 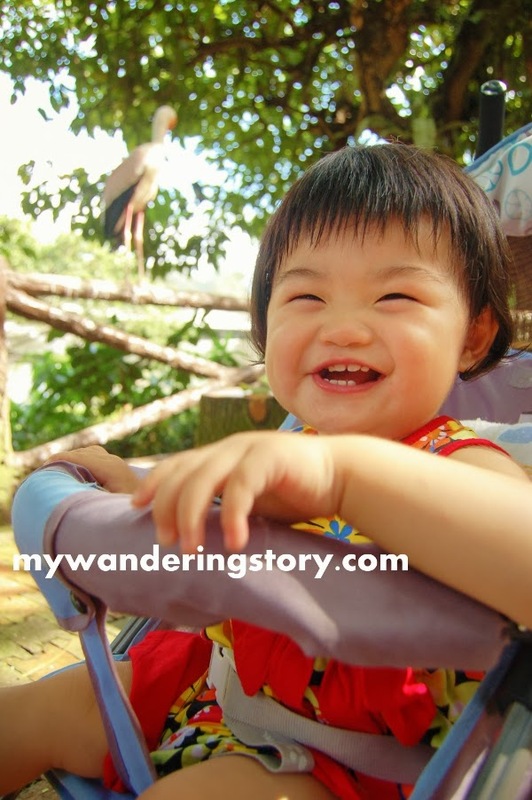 If you meet the above criteria and feel that you can share your motherhood story in this one-to-one short interview session on the above date, please do contact me at mywanderingstory@gmail.com before Friday, 1st of November, 2013 for further logistical arrangements. Thank you so much and I look forward to see some Penang mothers joining these interesting interviews on the subject that you definitely know best, just like the back of your hand! P.S. Dear readers, should you know any Moms in Penang who may fit the above criteria and be interested in joining these interviews, it would be fantastic if you could share this opportunity with them. Thanks much! Updates: We have ended these interview sessions yesterday. Thank you to those participants who took their busy time to join the market research and also many thanks to those Moms in Penang who showed their keen interests to join us! Yesterday was actually my second time of perming my hair permanently in my entire adult life. The previous one was done when I was in the university. Those days, my curls didn't last long on my head because I decided to turn it back to a straight hair after 3 days. Back then, I didn't have enough confidence sporting curly hair and was too used with my straight hair. Every time I looked at myself with the curls in the mirror, it always felt like I was not seeing the real me. Also, the curls I had was way too small and curly for my liking and there was a friend who called me Sarimi every time he looked at my curly hair. Thanks to that funky nickname, my self confidence level with curly hair sank to sea bottom and I was even more encouraged to straighten my hair back. Gah! My poor hair during my university years was an obvious victim of strong hair chemicals abuse; hence, often dry and frizzy. By the way, Sarimi is a brand of instant noodles in Indonesia, not exactly a popular name of some ulu girl in Malaysian or Indonesian village. Back to the the present day's hair perming topic, perming hair at a salon took about 2 hours' time in total. The hair salon I went yesterday provided women magazines for customer reading but 97% of them were in Mandarin. Clearly, I could not read them. I only flipped pages after pages of a couple of the magazines in front of me and looked at some of the pictures of the fashion features. Then I got bored and played some puzzle games on my iPhone instead. However, as I failed the level I was playing again and again, I got silently angry at the iPhone games and quit playing them altogether. My new curls and I. In the end, I made another Naomi's comic from her old pictures to kill the time whilst getting my hair done. Here's the comic result made out of my boredom attack at the hair salon yesterday. Issue #5: Naomi and her prayers. The above comic was highly inspired by some of the Korean actors I really adore. OMG I'm almost 30 y/o, mother of a child and pretty obsessed with some Korean actors as young as my little brother! After my siblings introduced me to some Korean drama series months ago, I got pretty attached to Korean dramas and suffer from mild Korean drama fever. I don't watch these dramas all year long but I do finish some Korean dramas when I have the opportunity i.e. no part-time work to do. Finally, K-drama lovers out there, don't you always feel like you just broke up with your boyfriend/girlfriend after watching the last episode of a drama series? It is always utterly hard for me to move on to a new drama after finishing a drama series. I mean after all the laughters we had and tears we shed during the 20 episodes we go through with all the characters in one series - somehow, there should be some strong serious relationship built between them and us, right? Entering her second year, Naomi is now a toddler with unremarkable burst of energy when she is awake. She is one very active kid who seldom sits still and with her daily energy burst, I often lose mine. Naomi's being exceedingly energetic overwhelmed me at times and led me to consult her paediatrician about this matter a while ago. I was seriously wondering if Naomi is hyperactive because I don't think that she ever feels tired and can't stop moving even for a minute, just like the Energizer bunny. Doctor's verdict said that Naomi is not hyperactive. She is just in the phase when she is very active, loves to explore things around her and very curious about everything. Doctor told me that usually after a toddler hits 2 years old, he/she will slow down. Can't wait! How can I be angry at her looking like this? These days, with more confidence on her feet, Naomi walks non-stop even when she is confined in a closed-door room with me. On top of that, Naomi is also quite a relentless climber. I just cannot comprehend how scrambling onto chairs, tables or chairs with wheels is so much fun. I don't know how many times in a day I have to scold her and drag her out of a chair she is climbing because I don't want her to fall down. This girl is just living life with gusto. In the past few weeks, Naomi's language skills are growing without boundaries. When she talks, she talks around the clock. However, almost none of us understands what she says. Unless Naomi wails, says "Mamamama" and points her fingers into something, then we'd know that she wants something. To date, her vocabulary that matches to our Mandarin vocabulary words namely Papa, Mama, 这个 (means this/this one) and 报报 (which to her means carry me now!). She also make specific sounds that I can't copy when she sees dogs in the real life or on TV. Nowadays, Naomi is in love with playing sorting toys and bead roller coaster very much. She hardly cuddles her soft toys - not sure why. She enjoys making scribbles on the erasable drawing board her Grandpa bought her not long ago. In addition, she finds enormous joy in filing and emptying stuff from a container, thus making a mess everywhere without being able to clean them back. She also loves spilling water from her bottle or cup and playing around with that spilled water on the floor. Further, she thinks that dustbins are interesting objects to explore thus she loves playing with them. I usually vehemently carry her away from these 'toys' before she takes the dustbin's contents out and at the same time, nag like a grandma about how disgusting and dirty dustbins are (but she just doesn't get the message!). Another skill of hers that I find rather irritating is her ability to inspect a place's hygiene. She is able spot the smallest speck of dust and dirt on the floor, then she will pick it up and eat it. Gawd! Also, Naomi now starts learning doing stuff all by herself. For instance, drinking from a straw cup or sippy cup or a bottle by herself, feeding herself with food in a small bowl with her hands or a small spoon, letting off adults' hands when we want to hold her when walking in a public area. Where's my fragile and dependent baby gone? Next, speaking about her attitude again, recently Naomi has also appeared to be defiant. When I tell her "no" to something bad, she does it anyway. When I take away something because I want her to have something else, she'd throw the thing I offer to the floor and scream. Oh, did I mention that now she throws tantrums when her wish is not fulfilled? On another note, I feed Naomi with steamed rice soon after she turned one. With this, another Mommy's duty for me is to cook a soupy, tasty and healthy dish for Naomi every single day. Else, she won't eat her solid food. She still sleeps very late at night. Sometimes my husband and I sleep first before she sleeps because we can't keep up with her timing any longer. I guess bad habit is hard to break. Anyway, although Naomi is now kinda naughty, I know that she is actually not being deliberately good or bad because she is still very young. Overall, she remains a strong-willed, happy, funny and jolly kid even though she doesn't really that approachable to strangers who try to talk to her as before. Naomi dances and claps her hands when she hears music. She hums when I sing to her. Moreover, her ability to imitate adults is just amazing. I mean look at how she holds my broom below. She must have known that Mommy desperately wants a maid seen me sweeping the floor so many times that she mimicked me sweeping the floor too! Ah, my new maid is here! Finally, if you complain that taking care of a newborn is tiring, wait until you babysit a very active toddler. You'd see why at the end of the day you become so tired and just crave lying on your bed all day long. Nevertheless, it's been wonderful to see how your kid grows everyday and being mesmerised with his/her surprising developmental milestones. By the way, if you wish to see Naomi in action e.g. dances, piles pillows, plays peek-a-boo, shares her pacifier with me and more - watch her funny short videos in my Instagram account. 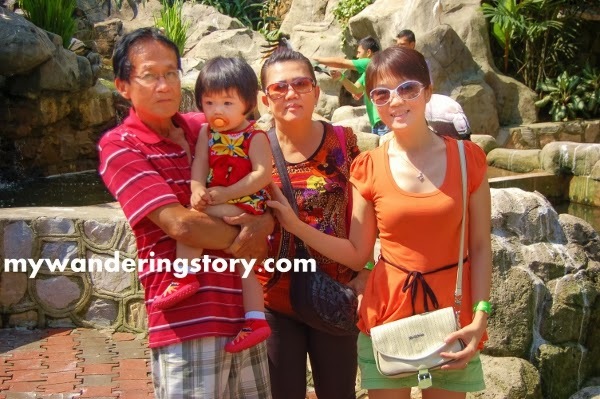 Naomi, who is half Malaysian and Indonesian, was born in Malaysia and as Malaysia doesn't recognize double citizenship, she automatically follows her Dad's nationality. This said, Naomi only holds Malaysian citizenship and passport. 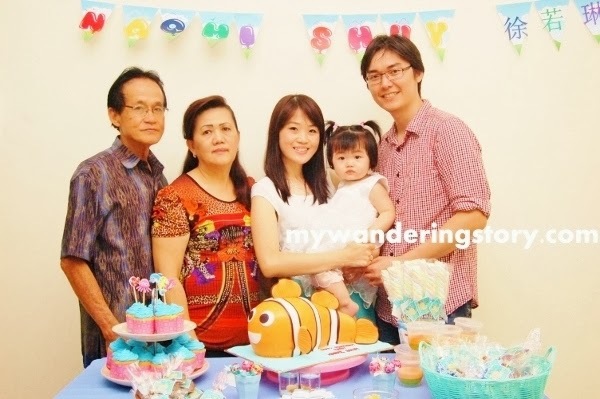 On normal basis, Naomi is permitted to enter and remain in Indonesia for 30 days from the day she enters her Mom's home country for social visit. As I plan to return to Indonesia with Naomi for a period of more than 30 days, I would need to get the special immigration facility for Naomi through Affidavit application from the Indonesian Embassy in Kuala Lumpur so my child can stay in Indonesia with me for more than a month. With this Affidavit, when travelling to Indonesia, Naomi who holds Malaysian passport is exempt from the obligation to have a visa, immigration permit and re-entry permit. In essence, she can freely re-enter and stay in Indonesia for more than a month. 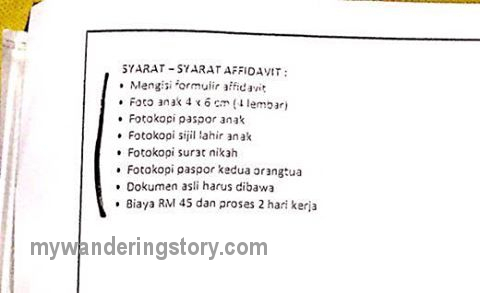 Applying for affidavit for children born from a mixed marriage (Indonesian and Malaysian) is relatively easier, less stressful and more straightforward than renewing Indonesian passport in the Indonesian Embassy in Kuala Lumpur. The only minor challenge was probably the waiting period for submitting the paperwork. We waited for about 2 hours just to submit the documents required to obtain Naomi's Affidavit at the counter in the Visa Section office. I naively thought that this office would be quiet but I was so wrong. The small office with just 4 available counters was full house of applicants. Anyway, below is the detailed list of documents we need to bring for applying our child's Affidavit from Indonesian Embassy in Malaysia. Just make sure that you have all the below documents ready before submitting them to the officer at the Visa Section in the embassy for smoother application process. All the above original documents (e.g. original passport books, marriage certificate and child's birth certificate) must also be shown during submission for verification purpose. taken from the form as per December 2016. Go straight to the information counter just below the Visa Section's office near the Embassy's exit passage and passport renewal waiting area. Obtain the form for applying Affidavit from that information counter (he/she will ask us to show all the documents needed before giving us the form). Fill the form and show the completed form to the officer in the information counter to get the queue number. Go upstairs to the Visa Section office and queue for your turn. Submit the filled form and all the above-mentioned required documents to the officer. If our application is successful, the officer will ask us to pay the processing fee and give us a receipt for collecting the Affidavit (letter/statement) after two working days. When I was renewing my Indonesian passport at the embassy some months ago, I thought of applying Affidavit for Naomi as well. However, my intent to submit the documents to the officer at the Visa section was declined because applicants cannot do the document submission in the afternoon. Therefore, be sure to come to the Embassy early in the morning for the paperwork submission and bring your child as well. The Visa Section office only accepts application and documents submission from 9am-1pm and does immigration permits/visa/affidavit certificates' collection at 2pm-5pm on working days. Further, the officer said that the Affidavit that I got for Naomi is valid until Naomi turns 18 y/o (or perhaps forever - not so sure about it but I will check on this again with the immigration officer once I arrive to Indonesia). However, he did mention that I can laminate the letter so it keeps better and must not lose it. He also stressed that this Affidavit is only to be shown at the immigration in Indonesia. My parents bought a musical bee toy for Naomi when they visited us more than a couple weeks ago. This toy has loud song, wheels that make it move around and colourful bright lights similar to disco lights when its switch turned on. When my parents first gave this toy to Naomi, this toy scared the hell out of her because actually its shape is not that cute and its loud song is pretty annoying. Furthermore, its giant eyes almost look like the eyes of a monster fly. Nevertheless, days later Naomi started befriending this scary bee. These days Naomi is already so smitten with this toy and she would cry if I turn off the toy's switch. She just loves the crazy song and bright lights when this toy moves around the room. Naomi would cry and cry and cry if I ignore her requests for turning this toy's switch on because I think she has overworked this poor bee toy already. I mean we have changed this bee's batteries like 3x3 already since it first entered our house on end of September. Additionally, I find Naomi's love towards this toy is kind of weird. She loves this toy yet she loves to abuse it at the same time. She bites its antenna which produces green light. She lifts this plastic bee toy by holding one of its wing and carries it around in this way without mercy. She bites the bees' wings all the time. She munches the bee's feet. She kicks the bee from behind and many more. Anyway, TGIF and here's the latest comic of Naomi and her BFF (Best Bee Friends Forever). Issue #4: Naomi and her BeeFF. Hop over my Instagram account if you want to see the 15 seconds video of how Naomi treats her dearest BeeFF. Lastly, happy long weekend to those who stay in countries which celebrate Hari Raya Haji this coming Tuesday and decide to take leave from work on Monday. I was itchy to bake chocolate muffins yesterday. I was so eager to bake and started browsing some muffins recipes but I was actually quite feverish from my throat infection. Hence, baking plan was cancelled. This morning, when I was having my breakfast and checking Facebook, I saw someone posted a chocolate muffins recipe in Mandarin. I thought it was so easy to do. Although I can't really read the whole content of this muffin recipe in Mandarin, I somehow managed to translate the muffins' ingredients required from this recipe (thanks to my educated guesses and basic Mandarin reading skill). Moreover, the step-by-step tutorial photo that the author published was quite self-explanatory so it was all good. Long story short, in this very Thursday's rainy afternoon when my little darling is napping, I had some me-time in the kitchen testing this muffin recipe which turned out great. Here is the chocolate muffins recipe that I used today. My double chocolate muffins using twin chocolate chips. Sift flour, cocoa powder, baking soda, baking powder and icing sugar in a bowl. Pour the chocolate chips in the flour mixture. Gently mix well by using a dry spoon or spatula. Set aside. In another bowl, lightly eat eggs and vanilla extract by using a whisk. Add the liquid milk into the beaten eggs. Mix well. Combine the cooking oil and melted butter into the wet mixture by using a whisk. Pour the wet mixture to the dry mixture and combine well by using a rubber spatula. Do not over mix it. Pour the muffin batter into muffin cases to just 7/8 full. Bake the muffin in preheated oven (160 degree Celsius) for about 25-30 minutes or until the inserted cake tester comes out dry/clean. This was actually my first time when I am sort of pleased with my muffins' final result. The chocolate chips that I added into the muffins melt after baking so imagine how chocolaty these muffins turn out. In addition, today's chocolate muffin texture was so moist. These babies are so good when eaten warm. Make sure your oven is really hot before you bake the muffins. Super hot oven temperature will ensure perfectly puffed up muffins' dome. Do not over beat the muffin batter when combining the wet and dry ingredients. Excessive mixing will give you tough muffins. The muffin batter are meant to be lumpy. Almost immediately put your muffin into the hot oven when ready. Don't let them sit in the open air for too long as the baking powder will start working by the time it mixes with the wet ingredients. Fill your muffin batter into the muffin cups just about 7/8 full. Too little of muffin batter won't give you nice muffin tops. Too much muffin batter will 'destroy' your muffin - your muffins' tops will fall all over the place during baking time if you put too much batter on the muffin cases. The latter is just heartbreaking, I tell you. A day before my parents went back to Indonesia last week, my husband and I brought them to visit KL Bird Park. We got cheap tickets priced at RM 12 per pax to enter KL Bird Park when my brother-in-law went to Matta Fair a couple months ago. 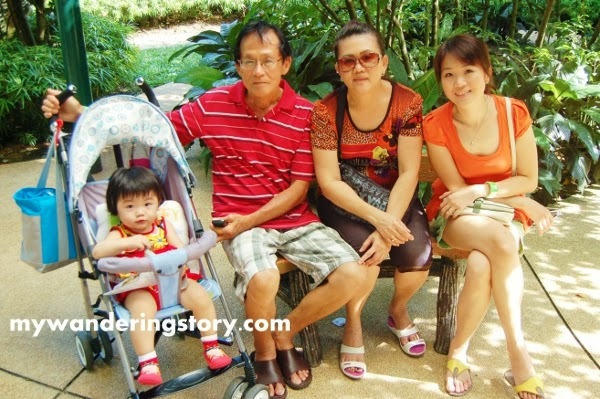 Since my husband and I had never been to KL Bird Park before, we thought it was a great idea to visit this place while at the same time, taking my parents to have some sightseeing in a new place in Malaysia. We left Seremban to KL Bird Park incredibly late on Sunday two weeks ago. Naomi was fussy beyond belief that morning and it was pouring at noon too. That's why, we only headed to KL at around 2pm something and by the time we arrived to KL Bird Park, the bird feeding or shows were already over. Sad. 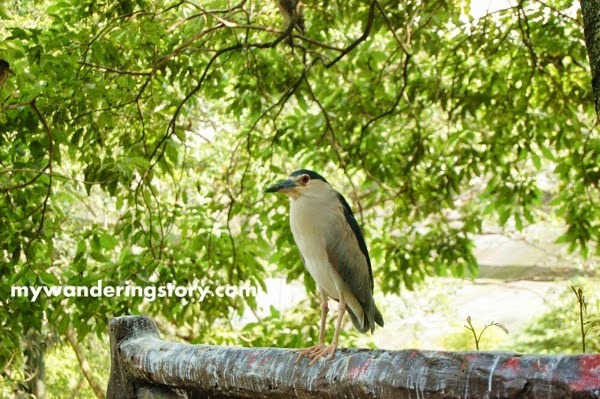 KL Bird Park is apparently world's largest free-flight walk-in aviary and was first opened back in 1991. It is located within the serene and scenic Kuala Lumpur Lake Gardens, about 10 minutes away from the Kuala Lumpur city center; hence it was relatively not so difficult to find this place by car. Hello from KL Bird Park! The first reaction my Dad gave when we were about to enter the Bird Park was "Wow, the smell!" Sorry to say but the birds' poop made this place quite smelly. However, once we entered the park, the smell got slightly better so the air inside this bird park was quite breathable. Anyway, it was truly a hot day when we visited KL Bird Park. I began sweating already by the time we stopped by the first pond with lots of bird surround it to take picture. As I slowly explored the KL Bird Park, I always thought that this place was really like a rain-forest. The bird collections, facilities and displays are sadly not so modern and beautifully arranged as in Singapore's Jurong Bird Park. In my opinion, KL Bird Park is more like a place to quietly taking a stroll in a massive peaceful park full of tall trees whilst noticing some birds roaming free and in cages such as eagles, parrots, cassowaries, etc. 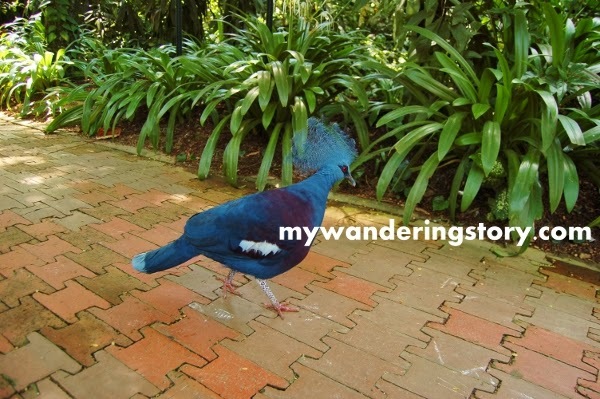 Along the way, we encountered lots of Indian blue peacocks, Victoria Crowned Pigeons, doves and white birds whose name I don't know, walking around freely at the entire Bird Park. The white birds I am talking about. Victoria Crowned Pigeon at KL Bird Park. Peacocks were literally everywhere in the park and it was seriously our first time interacting with so many peacocks. A peacock was in front of us. Another peacock was walking behind us. A peacock stood in a tall tree's branch. Peacocks here and peacocks there. Nevertheless, it was quite amusing too to be so near with lots of peacocks. Too bad, my husband and I didn't take any good picture of the extravagant peacocks to show here! We put Naomi in her stroller and she found the peacocks and white birds that walked around her so interesting. I think Naomi was even trying to communicate with them in baby language when they came near her but clearly, the birds didn't understand her and walked away instead. Naomi helped us eating reading the map! Lonely bird at KL Bird Park. Moving on, we arrived in an area with a small river beneath where it hosts lots of white egrets and only one or two scarlet ibis. 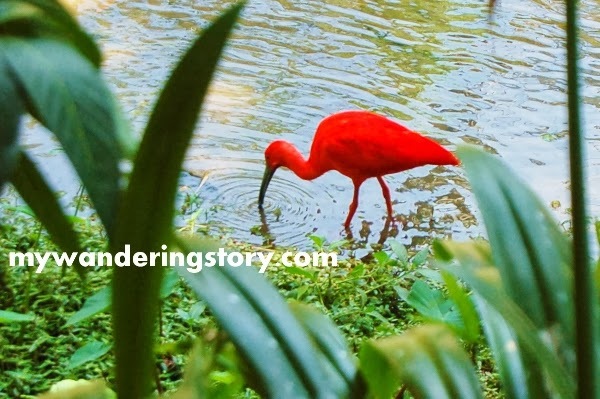 My parents were so stunned with the appearance of the scarlet ibis which was so outstanding amongst the white egrets. At one point, my Dad purposely walked down near the river just to get some photos of the scarlet ibis in a closer range using his old Nokia phone. When he did that I commented "Dad, what are you doing? Trying to be a National Geographic or Discovery Channel photographer or what?" He ignored me. Perhaps, my Dad didn't even know the National Geograpic or Discovery Channel I was talking about. My Mom really likes the scarlet ibis photo she captured using her phone and used that pretty bird picture as her BBM profile picture for a day. Stunning Scarlet Ibis at KL Bird Park. 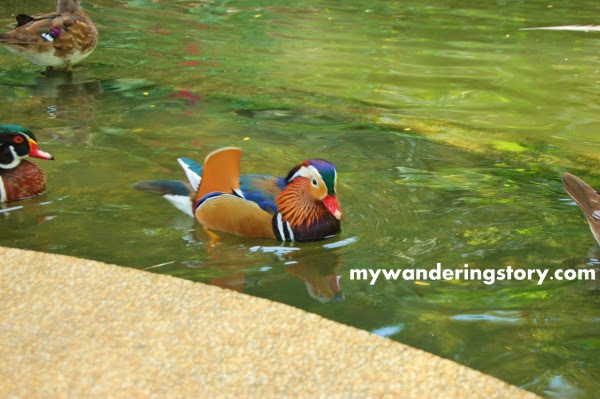 Another memorable stop at the KL Bird Park was the pond with lots of pretty Mandarin Ducks. Every time I see them I always think that Mandarin Ducks are used as popular regular models of calendars then and now for a reason. They are very pretty. Period. The prettiest ducks on earth! I must say that exploring the world's largest aviary was so tiring for people who barely exercise like us. I mean this place is so huge and not to mention the heat too! Taking a rest at a bench in front of the Mandarin Ducks pond. We walked further down and found a site with lots of flamingos gracefully sun-bathing in a nice landscape pond. In front of the Flamingo Pond. Next, we checked out the scenery of the man-made Waterfall Aviary inside the KL Bird Park. This Waterfall is so picturesque but sadly by then, we didn't have much energy left to carefully explore this place other than taking a couple of pictures in front of it. In fact, my parents and I were already so anxious to find the exit of KL Bird Park. Gorgeous Waterfall at KL Bird Park. Sprawling approximately 21 acres of verdant valley terrain, KL Bird Park got us lost several times when we tried to find the park exit. I think there was some places that we circled twice as we tried to get out of this park because this park is really, really big. Happy Naomi decided to walk around KL Bird Park too! A while later, we finally found the correct way to get out of KL Bird Park and our 2 hour visit at KL Bird Park came to and end. Bye-bye KL Bird Park. We were sweating like a pig by the time we found your exit gate. Thanks to KL Bird Park, we had our healthy body exercise which we had not had for a long time whilst directly interacting with various birds at the park. Naomi has been experiencing on-and-off fever in the past three days. On-and-off fever means she got better after she took paracetamol, but once the medicine's reaction wore off, her body temperature spiked again. When her body temperature was high, I spotted some rashes on some part of her body but they were on-and-off too. All the while, we thought her temporary rashes were due to her body heat. Get well soon, cutie patootie! Today is day 3 of this on-and-off fever so I reckoned it's time for doctor's visit because home medication didn't work anymore. Naomi's lost her appetite since last evening and we needed to seek the culprit of her fever the soonest. My husband and I brought Naomi to a paediatrician in town this afternoon. After some checking and consultation, doctor concluded that Naomi's fever was due to mild throat infection and her rashes (which then were not so obvious) were likely due to food allergy. He asked us to avoid eggs, seafood, honey and food that contains artificial colouring on Naomi's diet for the next two weeks or so. Doctor prescribed us with some syrup medicines for Naomi's throat infection and allergy and cream for her rashes. Thinking back, we had been introducing eggs into her diet since last week so maybe her body couldn't take it. Anyway, this evening her body temperature rose again and this time around, to my horror, her rashes appeared to almost of her whole body. I am not sure if the rashes are due to food allergy or measles but they do give me some fright. I guess if the rashes persist, we ought to see the doctor once more tomorrow. On another note, my husband and I always go through very exhausting episodes when dealing with an ill kid who always refuses taking medicines. In fact, Naomi had just puked the entire content of her stomach right after we forced her to take her medicine about one hour ago. Naomi's vomit was all over my left shoulder and arm and her body, hence a pyjama change again. My husband just mopped the floor in our bed room because Naomi's colossal vomit were literally everywhere. This said, do you have any diamond secrets on how to make a kid, who is aware of the existence of medicine right in front of her, to take medicine peacefully? My husband and I have tried 3ml syringe, tea spoon and pipette to administer the syrup on Naomi but all of them are always met with firmly clenched mouth (picture a loyal covert agent who is forced to spill a secret on thriller movies! ), spill, spray out of mouth or best, massive vomit from one very angry and resistant toddler who is not feeling well. Also, we have tried the rough way i.e. holding both of Naomi's hand forcefully when giving the medicine into her mouth and the gentle ways that normally involve singing, persuading, sweet talking, etc. ; however, all of them are mentally and physically draining us because they still fail us sometimes. I have personally tasted all of Naomi's syrup medicines to prove that they don't taste bitter. Trust me, they are confirmed as sweet as sugar (ask the banded sugar ants if you doubt me) and some of them have delicious fruity flavour too. Finally, dear veteran parents, if you happen to know the tricks of the trade in giving medication into a toddler peacefully and preferably don't involve any sternness, please share with me. Much thanks! 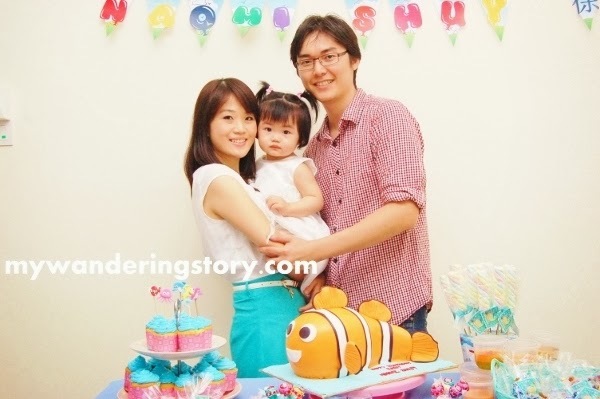 Last Saturday night, we held Naomi's belated first birthday party at home. Two months ago, I was heavily contemplating whether I should do her first birthday party or not. After seriously considering that first birthday is a huge milestone for any baby and I would highly likely regret if I didn't celebrate it, my husband and I gave this idea a go. We invited about 40 people for the party. The guests for this small birthday bash consisted of our close family members, friends and neighbours. For Naomi's first birthday party, I picked the "Under the Sea" theme because my husband and I would have to do most of the birthday's party preparation details by ourselves and thought that we would manage to pull this party theme through. As we had limited budget to work on Naomi's first birthday party; my husband wanted to do the party at home instead of at a restaurant. He felt that hosting a party at home would be more meaningful, merrier, less boring and warm. I would love to agree with him but I must admit that initially I objected his idea because I foresaw the immense work that we had to do pre, during and post the party at home. In the end, this time around my husband won and he got my buy-in to do the party at home. Given the limited budget that we spared for Naomi's birthday bash, I capped RM 500 (equivalent to around US$ 150) for all items required to create her decorated dessert table or sweet corner. We ordered some Chinese food and two buckets of KFC Fried Chicken for Naomi's birthday dinner buffet. The plastic tables and chairs for the guests were borrowed from my Mother-in-Law's opposite neighbour, so there was quite a saving involved in that department. I insisted of creating sweet corner for Naomi's birthday party because the birthday party pictures would be so much nicer with the existence of a sweet corner. I did the shopping, birthday goodies packing and decorating work in batches for Naomi's party because I had to complete my part-time work and baby sitting Naomi at the same time. I spent weeks in preparing Naomi's birthday bash. Under the Sea themed birthday party. I ordered her cupcakes and Little Nemo birthday cake from two different bakeries. Fortunately, we managed to find bakeries which could provide really nice cakes at reasonable price that met our budget. 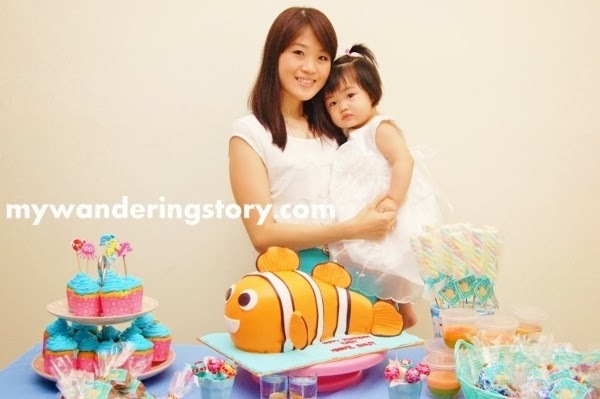 Cute Little Nemo Fondant Birthday Cake, weighing 3.4 kg. The bakery only made the plain cupcakes with blue butter cream on top. At home, I added some mini silver balls and placed some thick sea creatures stickers glued on satay bamboo sticks on some of the cupcakes to create more Under the Sea feeling to the cupcakes. Under the Sea vanilla butter cupcakes. Assorted candies, cookies, lollipops, marshmallows, chocolate bars were store bought. I packed them individually and placed customized 'Naomi's 1st birthday' label on each of them. The only home-made stuff was some rainbow pudding. A handful of assorted candies packed individually and placed in tosca basket. Individually packed Chocolate chips cookies. I replaced the store-bought chocolate bars wrapper with whale-printed wrapping paper. There were lots of measuring, cutting and gluing work involved indeed. It's strange that I used to hate doing all the kind of art projects and my Mom did them for me when I was at primary school; however I voluntarily went to this great length with the DIY details for Naomi's party. Motherhood surely changes one lazy and less crafty woman into a more dedicated and creative Mom. Mini chocolate bars wrapped in whale printed wrapping paper. As for the rainbow marshmallow holder, my creative Mom was the one who transformed IKEA plant pot into the this pretty base. She placed stereo-foam onto a silver plant pot and neatly covered it with the whale printed wrapping paper for the marshmallow sticks. Since we didn't have any perfect table for the sweet corner at home, my husband and I purposely bought one from the local supermarket and went to a textile shop to buy the 4 metres sea blue loose cloth for the table cloth. We engaged someone to sew the cloth into a nice and theme-matching table cloth about one week before the party day and luckily, we were able to collect it on Thursday. My husband did the birthday garland design by himself, printed them in his Dad's office and both of us soldiered on cutting them into triangle shape about a week before Naomi's birthday. Quite nice, right? Although the sweet corner that I created for Naomi was not that elaborated nor perfect, I was pretty pleased with the final result. Some of the attending guests complimented it too so I guess it was not so bad. As expected, during the party I was extremely busy. I was busy doing lots of things, including monitoring the new part-time maid to make sure that she did some work as intended during the party, and I didn't have much time to talk with the guests. My husband was busy hosting the party, running here and there and talking with the guests whilst my parents were mostly in charge of baby sitting Naomi. Chinese food spread for the birthday dinner buffet plus some KFC fried chicken for our Muslim guests. The birthday girl was napping upstairs when the party started and the guests started coming in. I woke her up at about 7.30pm and changed her outfit to her birthday dress so we could have nice pictures together. I mean I had purposely bought her a special birthday dress and created the birthday's sweet corner for her - it would be a vain if we didn't manage to snap some nice pictures with her, wouldn't it? The birthday girl hanging out with her cousins. Here are some pictures that we took with the birthday girl. Naomi was a bit grumpy that night, possibly because she was overwhelmed with the crowd at the party. Further, when my Mom changed her to her pyjamas later that night, my Mom discovered that Naomi's new birthday dress was not so comfortable on her. My Mom found red marks all over Naomi's body which probably were caused by the itchy fabric material of her birthday dress. Pity girl. Proud Mommy and her birthday girl. Birthday girl with Mommy and Daddy. 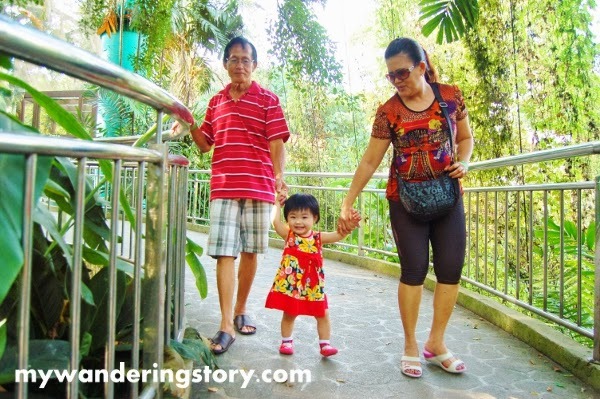 Birthday girl with grandparents from Indonesia. Birthday girl with some of Mom and Dad's friends. The birthday party officially ended at about 11pm. My husband and I still had to do the cleaning work after the guests went home as my part-time maid left at 10pm. This said, perhaps in the future, I would consider doing similar party at the restaurant instead of at home because I was literally drop dead tired on the party day. Anyway, I was a ecstatic Mom last Saturday. Although I was busy and not able to enjoy the party optimally, I was still happy and hope all the guests and the birthday girl enjoyed Naomi's simple Under the Sea First Birthday Party too. Glad to learn that the kiddos found the birthday goodies I prepared interesting and they were so excited in grabbing the goodies before they left home. 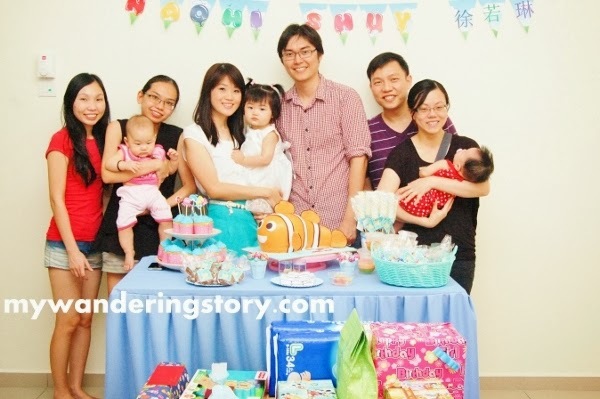 P.S: Naomi's first birthday party is featured at Kid's Birthday Parties on October 2013. P.P.S: Seemingly 3.4 kg birthday cake is a lot of cake to feed 40 not-so-hungry people. We kept the large fish head that was brutally cut during the cake cutting ceremony in our fridge. 5 days after the birthday party, Nemo's head is still sitting and freezing in my fridge. Clearly, we are not big dessert lovers.